Out of all of the modern interpretations of film-noir produced in the 1970s, The Long Goodbye (1973) is by far the most aesthetically interesting. This isn’t only because of its integration with counter-culture ideas and values, but with its continuous critical assessment of genre tropes. This critique, which extends to the literature and music as well as the films of the hindsight-based movement, is considered and constructed to be entertaining, but Robert Altman’s film manages to balance this with a knowledge of the creative norms and pulp sensibilities of the sub-genre. One of the most engaging and effect forms of critique that Altman puts into play is his use of music which, far from being just a re-run of the aural textures of classic film-noir, is a symbolic experiment reflecting the very nature of the film itself. Like a number of Altman’s early feature films, the score is by John Williams and produced well before the composer would lose himself in Holst rip-offs and tawdry hummability. His work on Altman’s Images (1972) the year before goes to show that the composer really could be as avant-garde as any of the less conventional composers. The music of The Long Goodbye is not technically avant-garde (whereas the music for Images verges on Ligeti-esque micropolyphony) but its use is innovative and surprisingly post-modern; surprising in the sense that, of all the things Altman could contextualise as post-modern in the film, the one aspect that is usually left behind is brought along with the rest of the modern inflection. The film is commonly known to have only one piece of music that is repeated over and over again but in different styles and contexts. This, however, is not technically true and a common generalisation that misses the recontextualised soundtrack that bookends the film. The Long Goodbye marks its opening and closing with the theme of Hooray for Hollywood, performed in 1937 by Johnnie Davis in the film Hollywood Hotel. With lyrics by Johnny Mercer and a big, swing feel, the music is typical of golden-age Hollywood and engulfing in its showbiz sparkle. It begs the question, why does Altman use this at such vital moments in the film? From other moments in the film, it is clear that Altman is trying to separate the time-span of his film’s setting and the more typical setting of film-noir (though set in the modern day, that modern day was between the 1940s and 1950s). Chandler’s Marlowe in the novel is far past the early days of The Big Sleep and Farewell, My Lovely and is instead at the later, more bedraggled end of his life filled with cats and friendly gatemen who only let him in if they can guess their movie star impressions. 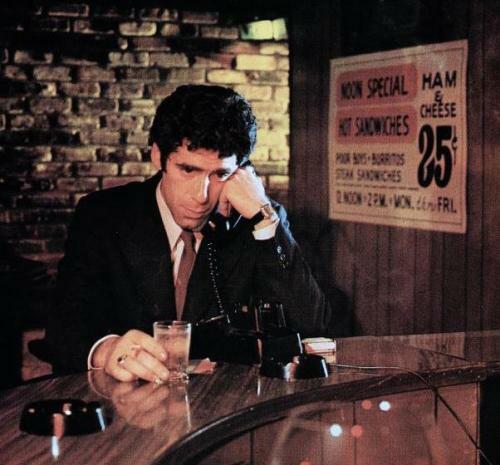 Altman represents this time-shift, both through an enjoyably loose performance from Elliot Gould but also in framing the film in a knowing acknowledgment for Hollywood’s past. It’s fitting that, at both times this music is used, Marlowe is at a relatively comfortable point in the narrative: the opening is before the problems for Marlowe have begun (his friend landing him in a situation after he apparently murders his girlfriend) and at the film’s end when he has finally solved the mystery and restored justice in his eyes. The previously mentioned reoccurring musical motif is an entirely different aspect that has multiple possibilities for reading. Apart from being co-written by Johnny Mercer again (he produced the lyrics here too as well as singing a version of the song used later on in the film), which ties in to the use of Hooray for Hollywood, the song recalls a more post-modern take on the typical jazz infused crime themes. Roger Ebert sides with Altman’s historic testimony that he repeated the song in its various guises more for his own amusement than anything else. Even if this is the only real reason for this aesthetic choice, there are more possibilities for reading it than just an exercise in humour. The song appears in a number of different ways. The most obvious is in the nondiegetic way during the film’s opening credits and then later on when it is used nodiegetically in the form sung by Jack Sheldon. This arrangement is a good starting point for the analysis as it seems to be the most fully formed version of the song. The lyrics use the theme of The Long Goodbye to tell a story of unrequited love which at first seems at odds with the narrative of the film. However, the lyrics could be referring to a number of possible relationships. It could be Marlowe’s relationship with his client, Eileen Wade (Nina van Pallandt) which seems to almost spark into romance but mysteriously seems to be absent from the screen. Another view could be that of Elieen and her alcoholic husband writer, Roger (Sterling Hayden); one of the two relationships that the title of film can refer to (the other being Marlowe’s with his friend). Either way, the song is presented in this form first in order to make sure the audience is fully aware of its later recontextualisations. The song then again appears nondiegetically throughout but instead is given various different musical treatments along the way. When Marlowe is relaxing in his apartment with his fussy cat, the theme is presented without lyrics and played in a relaxing lounge jazz arrangement (by Dave Grusin in its singular piano arrangement and by his trio in the more tonally experimental version). This occurs various times, as if trying to evoke the film-noir musical tropes while also providing comment by making them strangely ubiquitous. What this exactly is trying to say is up for debate though its consistency melody-wise does lend the film a sense of totalness, perhaps to smooth over the complex and hap-hazard happenings of the narrative. Even more strangely, the influence of the still thriving counter-culture of the film’s modern-day setting means the theme goes through some overt changes, namely when played on a sitar as a leitmotif for the all-girl hippy commune that live next-door to Marlowe. This is where Altman’s humour is perhaps more believable with the arrangement of theme being particularly amusing in this case. Yet this version sums up what The Long Goodbye is really all about; that the classic genre tropes of a canonized form were never really solidified and are therefore completely open to modern day recontextualisation. The last appearance of theme is again complex and perhaps the most unusual in the film. A number of different sung versions appear on the soundtrack but occur diegetically, whether they come from a radio, a television, or even a character actually singing the lyrics of theme themselves. This includes a more sultry version of the song performed by Clydie King which appears on a car radio and even again earlier through Marlowe himself who sings the lyrics from theme whilst feeding the cat. Having such aesthetics blocks off Altman’s narrative world in the same way that a musical does; the world being very earnestly a creation but one that the characters are happy to play along with. This also ties in to Gould’s performance which is so relaxed, he’s not even bothered about keeping up with the pretence, singing the theme song that only finished nondiegetically mere moments before. With this, it is clear that Altman was making a humorous gesture within the music of The Long Goodbye. But more than simply being a slap-dash collection of different comedic ideas used to save on making Williams write more than one melody and song, the music plays a vital role in showing that The Long Goodbye is a critique of the worlds of Chandler and Hollywood, and not simply an aimless pastiche of a genre already drowning in homage and nostalgic interpretation. Eraserhead (1977) – Sickly Soundscapes (David Lynch).